Preheat oven to 400°. Pierce each potato a few times with the tines of a fork. Lightly brush each potato with melted butter and sprinkle lightly with salt. Bake the potatoes directly on the rack of the oven for 1 hour, or until tender and cooked through. Remove from the oven and allow to cool on a rack for 15 minutes. Meanwhile make the pimento cheese. In a food processor fitted with the grater attachment, process the cheddar until shredded. Swap out the grater attachment for a standard food processor blade and add in the cream cheese. Pulse a few times to incorporate. Transfer the cheese mixture to a bowl and mix in the crushed red pepper flakes, diced red pepper and season to taste with salt and black pepper. Set pimento cheese aside. Preheat broiler. When the potatoes are cool enough to handle, use a serrated knife to slice each into three lengthwise sections – you should be left with two shallow ends and a middle portion which you can discard or use in another preparation. Using a small spoon, scoop out the flesh of each skin leaving a 1/4-inch border all the way around. Lightly brush the inside of each potato skin with remaining melted butter and season lightly with salt and pepper. Crumble pimento cheese mixture evenly over each potato and sprinkle on bacon bits. Place the potato skins on a foil lined baking sheet and broil until the cheese is melted, bubbling and beginning to brown, about 3 minutes. 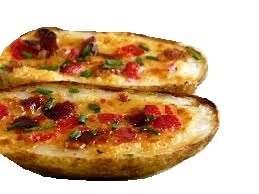 Remove potato skins to platter, sprinkle with chives and serve immediately.